One of the factors that can influence family harmony is the condition of balance between husband and wife. 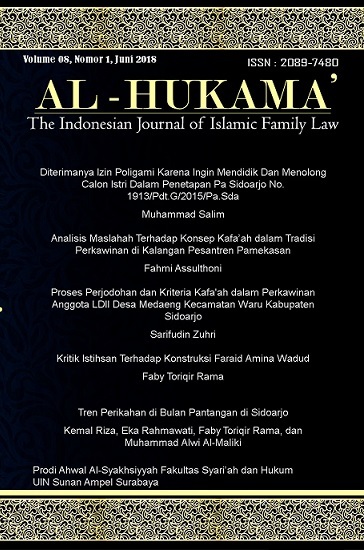 The phenomenon in some Islamic boarding house (pesantren) in Pamekasan show new things in the implementation of kafaah in a marriage system. Many of the kyais (the figures) mate and marry their sons and daughters with the closest people or from the same level and class. This research uses descriptive qualitative method and observation, interview, and documentation study to obtain data. The results obtained from this research are: in the process of choosing a mate to their sons, they as parents prefer and emphasize on the factors of the same nasab. The goal is for the struggle of continuing their Islamic boarding school, the creation of kinship with other kyais and so on. According to the perspective maslahah, such marriages can be justified. First, because there is a basis of the Qur’an and the hadiths affiliated with it. Second, the purpose of marriage with consideration of comparability will lead to many benefits. Third, the concept of maslahah itself requires that human beings get ease in a matter, and avoid the difficulties that hinder it later.